Media hype’s been buoyant for this boy’s debut, helping it chart at number 4 in its first week of release. Believe the hype? For once, I can. Here’s a sprinkling of the 20-year-old history of Jamie Treays (pronounced Tree - ay) hence the simple T. Jamie-T is from suburban Wimbledon. He’d be “middle” classed by most and comes from a stable home - two parents, two sons, unremarkable. Music is the only thing he’s never dropped in life. Since the age of 13 he’s been a curious teenager, exploring music history. Jamie has been known to make a mix tape or two. On them you’ll find a mish-mash of tasty flavours, a bubble n’ squeak for someone much older, say, John Peel, who surely would have approved. There’s hip hop, punk, rock, soul, funk, pop, spanning many decades, taking in The Stranglers, Ian Dury, Patti Smith, Paul Weller, Kate Bush, Noel Coward, Minnie Ripperton, Prince, John Holt. Jamie names Jamaican legends Desmond Dekker and Don Drummond, The Clash, The Specials and The Beastie Boys as a big part of his A list of influences. This is a boy with spark and bravery, someone prepared to have a go. He played drums in a punk band in his early teens, whilst secretly writing his own songs, eventually graduating to bedroom beats, bits and bass lines with simple equipment usually used for electronic dance 12”s. 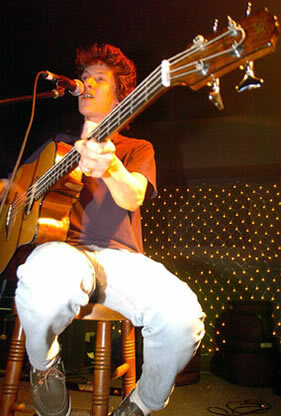 He did the lonely-singer-songwriter-acoustic (playing bass guitar) pub circuit. In 2006, London’s 12 Bar turned music fans away in numbers for Jamie’s “Panic Prevention” nights which significantly raised his profile. Music was his medication for crippling panic attacks during a mad four months hanging out in Putney, which made him agoraphobic for a time. Hence “Panic Prevention”. He retreated to his bedroom, his bunker, knocking out 15 tunes, creating the bulk of this debut. Half-recorded and produced by himself in his house and half-recorded and produced by 21-year-old Ben Bones (friend and member of the live band), Jamie’s songs are tales of suburban youth, tales of him and his mates, mixed around and fictionalised, remixed at random, observations, boys on the night bus, girls on the dance floor, in part, “lost boys in the lost town, with the lost girls in the lost and found”, a lyric from the bouncy, feel-good bass line sound of Operation,my pick of the album. Maybe a summer smash hit release, or perhaps too long for radio, it’s a corker, essentially two tunes in one, placed perfectly in the middle of the record between the acoustic quality of Back In The Game and the pop single, Sheila. Jamie is a master mixer. He’s said that he often starts work on a track by wanting to copy one he particularly likes. Salvador started life with Jamie wanting to write a song like Squeeze’s Cool For Cats and Them’s Baby, Please Don’t Go but it sounds like neither. There’s a nod to The Clash alone, with its hooky spaghetti western guitar backing up lyrics of young boys’ lust for the girls on nights out around the dance floor. The vocal delivery sounds like slang working class London drawl, but this is not some fake voice put on. It’s punk fused with other cultures. He owes Pete Doherty a drink and Joe Strummer a crate in heaven. In moments where he sings, the sound is not unpleasant, perhaps worth noting for the future. Jamie-T and Ben Bones are at their most impressive as producers. They have an ear for a great tune; there are no fillers on the record. Proceedings find cheeky urban keyboard and synth cutting in and out to great effect throughout. Then there are the three sides to Jamie-T’s sound. The acoustic lone bass playing rapper, that toe tapping bass so prominent throughout, making such a fresh change from the guitarfest rock n’ roll daily grind of Xfm Radio. Then there’s Jamie as urban popster, a hipper male version of Lily Allen, as heard in the singles, Sheila, Calm Down Dearest and If you’ve got the money and then, with his newish band The Pacemakers, a full-on, plugged in sound To make ‘em dance, the sound that pulled me into his show whilst just passing at The V Festival. Jamie-T follows hot on the heels of The Streets, The Libertines and The Arctic Monkeys. Comparisons with The Arctics for subject matter is obvious, although whilst hyped as a wordsmith of some merit, Jamie-T can’t match Alex T here. However, he also shares common ground for his musical knowledge. He seems in charge of his musical destiny (Virgin allowing two 20-year-olds to produce an album on their own - wow!?) and like The Arctic Monkeys you get the feeling he is capable of going in many different musical directions. For all his legion of influences, here is an album from a boy just daring to do his own thing. Deadly serious he said: “I’m aware of how important it is to do things your own way, then if it backfires, you can only blame yourself. I always wanted to just make this album for the moment, and nothing more.” Panic Prevention is proof of youth integration between cultures and nationalities in London. Music continues to break down barriers.